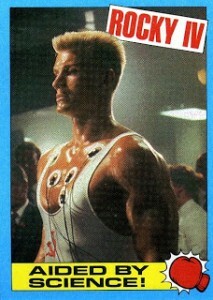 With the eye of the tiger and some classic Cold War tension, 1985 Topps Rocky IV trading cards are simple fun and full of Ivan Drago. 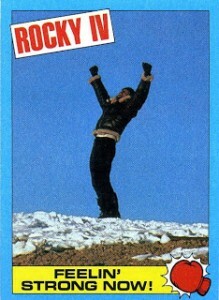 The second set of cards for the Rocky franchise (Topps also did a set for Rocky II), the set consists of 66 base cards and 11 stickers. It's not very big, but it does a good job of summarizing Rocky heading back into battle with the science lab specimen, Ivan Drago. Card fronts have blue borders. The movie's title is plastered across the top. The caption at the bottom is accompanied by a boxing glove graphic. It's nothing groundbreaking but it fits the film. Stickers are inserted one per pack. Images are set inside a die-cut glove. For fans of simple things, the packs are a lot of fun. They come in two designs, Rocky and Drago. If you put them next to each other, they make one larger image of the two combatants going at it. 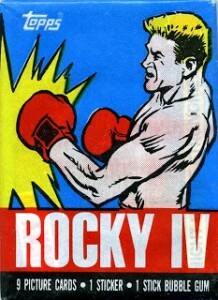 1985 Topps Rocky IV is still very affordable today. The small set size means that there's no shortage of them coming out of boxes. Supply is also fairly high given the product's age. That said, it's a cheap way to revisit one of the most beloved sports films of the 1980s. 9 UNOPENED PACKS 1970's & UP FRIGHT FLICKS,ROCKY IV & MORE! 66 cards. Shop for base sets on eBay. 18 The Power of Creed! 23 Drago Comes On Strong! 29 Power Of The Rock! 33 A Man Of Steel! 36 Night of the Strongmen! 39 Man With A Mission! 42 Clash Of The Super-Powers! 49 Rage Of The Rock! 50 Pounded Into Next Week! 52 Up, Up And Away!! 54 "I Won't Give Up!" 58 A Face Made For Punching! 59 Demi-Gods Of The Rings! 60 From Russia With Hate! 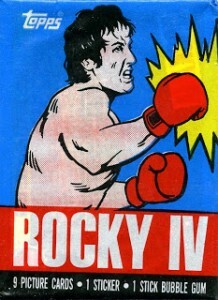 62 Rocky's Up, Drago's Down! 64 In Praise Of Balboa! 65 A Man For All Countries! 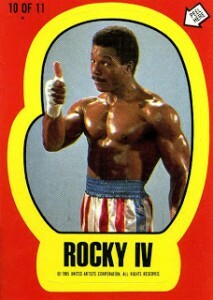 I have a pack unopened of tools rocky 1V includes 9 picture cards, 1 sticker, 1 stick bubble gum.